The management of combined posterior cruciate ligament (PCL) and posterolateral corner (PLC) injuries is a challenging, thought-provoking, and rewarding experience for the knee ligament surgeon. 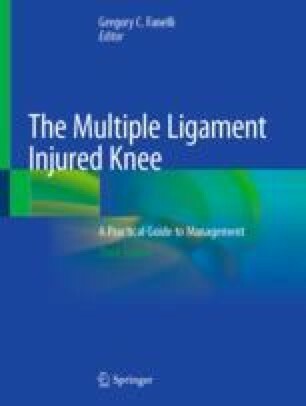 This chapter is intended to lay the foundation for understanding the evaluation and management of the acute and chronic PCL–PLC-injured knee. It reviews a brief history of the evolution of surgical management, followed by a detailed discussion of relevant anatomy and biomechanics, which is the critical starting point for surgical reconstruction and rehabilitation. The authors then present a novel technique for reconstructing the PCL and PLC, which employs the concept of graft tensioning and re-tensioning that is gaining popularity in knee reconstruction. Finally, the role of osteotomy in the management of this complex problem is explored. It is expected that both the veteran knee surgeon and one early in their career will gain valuable knowledge and technical pearls for performing combined PCL–PLC reconstruction. We would like to acknowledge the following people who contributed to this chapter. Dr. Catherine Coady, Dalhousie University, for photo and text editing. Dr. Laurie Hiemstra and Dr. Greg Buchko, Banff Sport Medicine, and Sarah Kerslake, M.Sc., for text editing. Susan Heard for drawings and text editing.